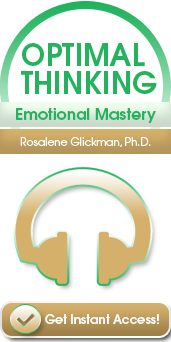 These emotional mastery resources contain at-your-fingertips road maps to understand and resolve manageable and unmanageable feelings such as anxiety, hurt, anger, disappointment, envy, guilt, loneliness and depression. When you answer the optimal questions on the Optimal Thinking Emotional Mastery cards, you immediately achieve understanding, explore your options, and determine your best solution to turbulent feelings. You align yourself with your greatest needs, and exercise emotional self-reliance by processing and resolving your feelings as they occur. Isn’t this what emotional intelligence is really about? Track 2: What is Optimal Thinking? 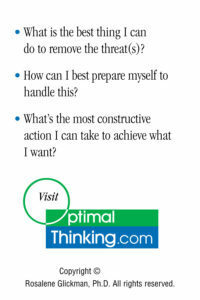 Track 4: What is Optimal Thinking?